This book is all about the Participation Age we are in and how getting the best out of workers is through making them an owner of their work and results. People work better when they have a stake in the company—and therefore are “stakeholders”, not “employees”. This is what the Participation Age is all about. The term “employee” refers to someone who is a child and must have a baby-sitter that makes sure he/she is doing their work properly. The concept of an “employee” was developed by Industrialists a hundred years ago. As you will see, these power-hungry Industrialists who hated capitalism created several business diseases that still infect the business world today. If you’re a small business owner, entrepreneur, or corporate professional wanting to create the best culture for your company, this book is a great resource. 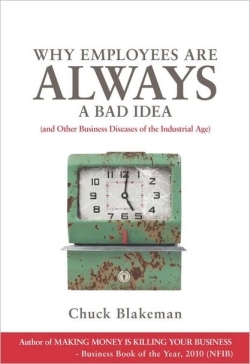 While reading this book you will discover remnants of the poisonous Industrialist mindset in your views of business, and then learn how to reset your views and business based on the successful Participation Age mindset. Small-business capitalists for hundreds of years successfully operated their businesses with a Participation Age mindset until the power-hungry Industrialists ruined the business world between 1850-1970 with their diseased views created to prop up their factory systems. I’ll quickly touch on the aspects of each disease of the Industrialists that I found most interesting. The concept of amassing power through business dominance was a new concept in the 1800’s. Before that, individuals would amass power by becoming a politician. For the first time, these same power-hungry individuals realized the could now become powerful by becoming an Industrialist. These Industrialists set out to destroy free markets by way of their connections in government as well as by way of creating the factory system, all to create “closed markets” that they could dominate. The problem with “big” is that the bigger they are the more problems they create for society—-the greater their impact on everyone around them becomes. When something goes wrong with a “big”, everyone else is affected. This doesn’t happen when the business world consists mostly of “small businesses”. The Industrialist mindset consists of the following: 1) be big, not great, 2) destroy free market capitalism and create closed markets, 3) resist progress and maintain the status quo, 4) destroy jobs on net during acquisitions, 5) don’t innovate or create, buy out others who create, 6) focus on competitors and either destroy, mimic, or buy them, 7) only use short-term decision making, not long-term. The capitalist mindset is counter to all of the above. The book includes some excellent tables that show the comparison between the two mindsets. Under the factory system, employees were transformed into an extreme division of labor, were de-skilled, and dehumanized. This part of the book really interested me. The author explains the history behind the world’s first business consultant and management theorist, Frederick Taylor. Unfortunately, Mr. Taylor was full of opinions and less about science when it came to his advice on workers. He made everyone believe that the average worker was stupid and lazy. This false “business science” was very useful for Industrialists. They used this mindset to create a factory system of mindless workers who would treated as children and therefore would be made to feel helpless and obedient to sever working conditions. Mr. Taylor also helped create the concept of “managers” as baby-sitters who he thought were necessary to make “employees” do their jobs. The answer to these diseases was and is to make workers stakeholders in the company who would benefit from the profit generated by their work. But, since Industrialists seek power and the money that comes with it, the concept of a “stakeholder” was not one that Industrialists were willing to accept. The Industrialists also needed to not only have obedient “employees” and “manager” to make them feel like children, they needed to strip the concept of “Making meaning” through work. Industrialists needed workers to come to work for a set period of time, day in and day out, to keep the factory system running at full tilt to out-produce their rivals in order to crush them and dominate a market. Lastly, the Industrialists needed workers to feel as they were dependent on the corporation for everything, from cradle to grave. The concept of “retirement” was created by Industrialists in order to make sure workers did not take time off until late in their life, when their full productive capacity would then be diminishing and of no use to the corporation. Pensions were developed to keep workers working towards that lifelong goal to someday enjoy life, and be taken care of by the same corporation until they died. The above section was very interesting and opened my eyes to the history behind much of the current mindset in corporate America today. This section is great for anyone who now wants to transform their business away from an Industrialist mindset and towards the Participation Age mindset. The final part of the book goes further in-depth into some other diseases of the Industrial Age. It also talks about how Industrialism tried to create a sense of safety, security, and stability (the 3 S’s), but Participation Age companies know that what workers really want is a feeling of significance. The author, Chuck Blakeman, built seven business over the last 25 years and has discovered over that time the benefits of instilling a Participation Age culture in his companies. Him and the associates of his most recent business have more time off to enjoy life as it happens, but are also more productive when working. The parts of the book that interested me the most were those on the differences between Industrialism and Capitalism. I also enjoyed the history behind the early business science guru Frederick Taylor. If you are currently concerned with instilling a culture in your own company you will benefit greatly from Parts II and III with all of the practical tips. My one complaint after reading the entire book was that there seemed to be redundancy of talking points, such as around the concepts of “employees” and “managers”. All in all, I would recommend this book if you are either interested in business history around Industrialism, or are ready to move into the Participation Age and need some guidance. I also had the opportunity to interview Chuck Blakeman, so please feel free to check out the his insights here as well.